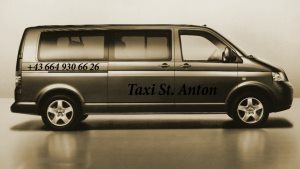 Taxi-stanton.com is a professional Taxi Service specialized in transfers between airports: Innsbruck, Zurich, Friedrichshafen, Memmingen, Munchen, Salzburg and Arlberg Villages: St. Anton, Lech, Oberlech, St. Christoph, Zurs, Stuben, Kloesterle etc. Our Taxi Service is available in the winter season 24 hours/day. Taxi St. Anton - Whether individual transfer, small group, family, friends, here you find the right taxi. To go: punctual, safe, friendly, cheap taxi in St. Anton! Spend your holiday in St. Anton and enjoy snow, wonderful views and the best parties in Tyrol! With our airport taxi service in St. Anton you can reach any destination in Arlberg without having to worry about trains, buses and subway changes. We have many years experience in the taxi transfer and have numerous satisfied business and private customers around the world. Our transport is done in comfortable, modern, clean, spacious cars, minicabs Volkswagen Caravelle with 9 seats. Airport taxi St. Anton Whether you like to go to the airport, skiresort, hotel, train station, next restaurant, disko, ski lift, apresski, or to neighboring villages, we bring you at any time and safely to your destination. Professional taxi service safe, fast, reliable, with quality and attractive prices. Take advantage of our special offers! Arlberg Villages: St. Anton, Lech, Oberlech, Zürs oder St. Christoph. Innsbruck - Zürich - Munich - Salzburg - Landeck - St. Moritz – Bludenz - Imst – Landeck Zams - Ötztal - St. Anton etc. Winter fans and sports enthusiasts are especially welcome to our unique winter wonderland where the 2001 World Alpine Skiing Championships were held. The giant ski area boasts no less than 83 lifts and gondolas, 260km of perfectly groomed ski trails and more than 185km of fantastic powder stashes. Winter holidays in St. Anton mean skiing all day long without taking the same ski lift twice! Among the most challenging slopes are Schindler Kar, Galzig, Gampen or Kapall. The Valluga and the Rendl areas offer everything a skier´s heart could possibly desire. St. Anton am Arlberg is a truly unique recreation paradise for the whole family. The cozy little town with 2,500 inhabitants has still maintained its genuine ambiance and charming atmosphere. Relax and unwind at the elevation of 1,300m where crisp and clean mountain air is guaranteed! Experience genuine Tirolean hospitality and spend the most beautiful days of the year among friends. Sankt Anton is part of the Arlberg area of ski resorts — a region that includes 94 cable cars and ski lifts, 340 km of groomed pistes and 200 km of deep-snow runs, all of which are covered under one liftpass. On the western edge of village is the "Galzigbahn" which has been replaced by a Funitel gondola. The new gondola includes a first-ever "Ferris wheel": enabling passengers to board the gondolas on ground level, then rotating the gondolas up to the main high-speed cables. The Funitel accesses the Galzig slopes and connects to Schindler and Valluga peaks. On the eastern edge of town, the Nassereinbahn rises to the Nasserein area with connections to the Kapall peak. The Kapall, Valluga, and Schindler peaks provide skiers with close to 1,500 vertical metres skiing. Slope-side après-ski bars can be found on the Steissbachtal trail just above Sankt Anton. The groomed runs in the region cater to all levels; 43% are for beginners (blue), 41% for intermediate skiiers (red) and 16% are for the more advanced (black). There are also 200 km of deep snow runs in the area. Expert terrain includes less-frequently groomed ski routes such as Schindlerkar and Mattun, and the backside of Valluga (2,811 metres or 9,222 feet) down to Zürs, which is for experts only if accompanied by a guide. There are also a large number of off-piste routes in the area that experts can explore with the help of a guide. Other ski areas are St. Christoph, a hamlet where in the 14th century the shepherd Heinrich Findelkind built a hospice as a shelter for travellers crossing the Arlberg pass to the Vorarlberg province, Stuben, Lech, Zürs, Warth-Schröcken and Klösterle/Sonnenkopf. Pettneu, Schnann, Flirsch, Strengen, St. Christoph, Stuben, Langen, Klösterle, Zürs, Lech, Oberlech.